Residents of Military Road were shocked to find no parking signs and barriers placed in the road without any notification. 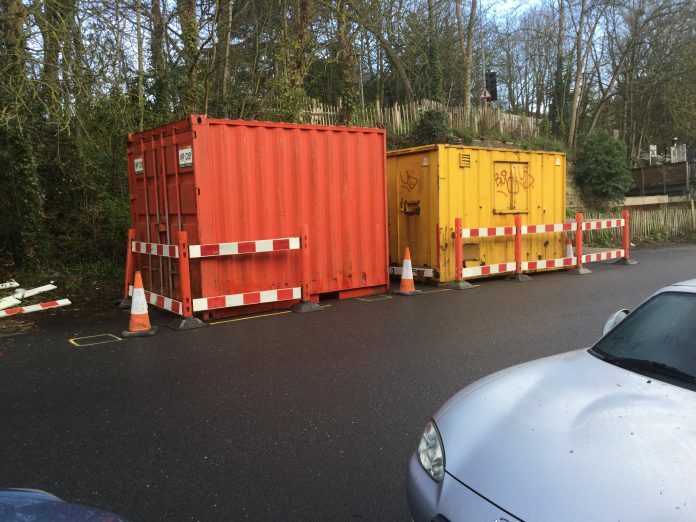 Then two large ugly containers were delivered on Tuesday April 2 and residents were told by the driver of the delivery lorry that the containers are for the workmen in Deadman’s Lane. Why then are these containers not in Deadman’s Lane and why were residents not informed in advance? Editor’s note: We can understand the irritation of residents in a road already overcrowded with cars belonging to owners who live elsewhere in the town, when they find even more space taken up by less-than-attractive storage units for work taking place somewhere else. The confines of Deadmans Lane probably mean that, in practise, it is not possible to locate the units there, and Military Road was the nearest practical option. It is unfortunate that the Highways Department of East Sussex County Council did not feel it necessary to inform local residents of their plans for these containers and one wonders whether a site visit was made in advance or whether the location was decided upon after simply looking at a map. As Rye News has recorded before, ESCC Highways have not always been noted for their efficiency or helpfulness when planning road repairs as this example from a few years ago demonstrates. It’s more the prolonged closure of Deadman’s Lane (one of the only two access roads to the town centre) and the traffic lights on Rye Hill that are cause for concern, I would suggest. A similar comment could be made about the move of the Recycling Centre from Gibbets Marsh to the Leisure Centre, beside the Scout building. The first indications were a small sign and CCTV cameras. Again there was no consultation or prior information for residents. In fact the move, which happened at the time of the Town Meeting, seemed to be news to councillors from RTC, Rother and East Sussex. So far, there have been no undue problems with nighttime noise, smells or overflowing bins. Does anyone know what is happening in Deadmans Lane or how long it will be closed? For those of us who travel into Rye from the north it is adding time and mileage to our journeys. Don’t think they’d fit down deadmans to be fair. the residents of Military Road , or nearby streets were told of the closure of Deadman’s Lane. We have been putting up with living on a parking lot for too long. It is time a bit of consideration was used by Rother instead of this cavalier attitude. Common sense says that Military Road should only have parking on one side. Instead it is restricted to a single lane hardly big enough for emergency or service vehicles. From what I understand Dead Mans Lane could be closed for up to six weeks, the reason is for emergency gas main replacement works. Many of the residents of Deadman’s Lane were not informed over any closure either , but on a plus side some of the deadly railings have been at long last removed . If Paul Osborne is correct, 6 weeks seems a lengthy to replace 250m of pipe in such a vital strategic location for the town?